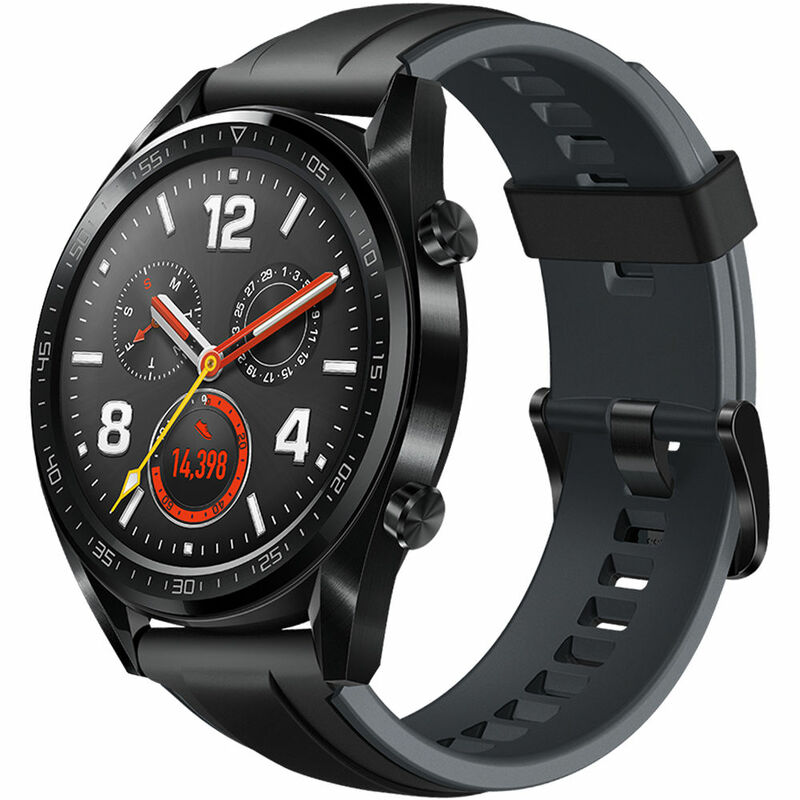 Packed with sensors and sophisticated programming, the graphite black WATCH GT GPS Smartwatch from Huawei is your guide, your coach, and your personal assistant. Monitoring multiple aspects of your life throughout the day, it's designed to motivate and inform you while you journey to a healthier and more productive lifestyle. The main interface of the WATCH GT is a brilliant 1.39" 454 x 454 AMOLED screen with vibrant colors and rich contrast. You can access everything this smartwatch has to offer through the touchscreen interface. During the day, the WATCH GT can pair with your smartphone to provide you with notifications, alarms, and reminders. When it's time to work out, the WATCH GT has the ability to track and document multiple data points for a variety of indoor and outdoor activities, such as swimming, cycling, hiking, and running. At the end of your day, intelligent sleep monitoring provides you with statistics to help make subsequent nights even more productive and restful. Throughout your entire day, the WATCH GT smartwatch can provide you with real-time heart rate reporting, access three different satellite systems for accurate GPS positioning, as well as statistics on your sedentary status, and basic movement like steps taken. While your usage may vary, the battery life of the WATCH GT can power through up to two weeks of typical activity, which includes heart rate monitoring and 90 minutes of exercise per week. Constructed from strong and durable ceramic and stainless steel, with a DLC coating, the WATCH GT is made to be there when you need it, day after day. HUAWEI's TruSeen 3.0 heart rate monitoring technology utilizes multiple sensors and a self-learning algorithm to help provide you with accurate readings when you need them. Running: The WATCH GT gives you your choice of running courses to work on achieving, ranging from introductory to advanced levels. You get real-time feedback as well as final results. It will keep track of your heart rate, pace, distance, time, and VO2 Max. It will also let you know your record to beat. Swimming: The WATCH GT is water-resistant for up to 164' and can recognize and monitor your specific stroke, giving you feedback on how to improve it. It will also automatically give you a SWOLF score when finished. Cycling: During this activity, the WATCH GT will monitor calories burned, your heart rate, distance, speed, and accumulated climbing and falling stats. Hiking: Utilizing its barometer, compass, and altitude sensors, the WATCH GT helps to give you vital stats while out hiking. It also includes a 3D distance feature and the built-in GPS helps to keep you on the right path. The WATCH GT utilizes a sleep monitoring program that has been produced through a joint-study with Harvard Medical School CDB Center. Integrated into Huawei's TruSleep 2.0 software, it can identify common sleep related issues and provide you with over 200 suggestions on how to alter your habits, helping you achieve a more restful and refreshing night of sleep. Box Dimensions (LxWxH) 10.8 x 5.3 x 4.8"
WATCH GT GPS Smartwatch (Graphite Black) is rated 3.8 out of 5 by 4. Rated 5 out of 5 by mitchell from Fine example of a fitness watch Not really a smartwatch because of the absence of the regular assortment of applications and functions. Superfluous functions and their battery hungry features have been left out. Intuitive and easy to use fitness tracking is the centerpiece of this device. Attractive, well made and feather light. One plus days of moderate usage drained the battery by 16%; my other smartwatches would have had 16% remaining. Best sleep application on the market. Just a marvelous device. Rated 4 out of 5 by Luat from Excellent Watch Huawei GT has a very exceptional screen like Galaxy watch and Apple 4 watch. It is very clear during workout and the battery lasts at least 10 to 14 days with 0.5 to 1 hour of activity each day. The only problem is GPS is erratic when it comes to real pace during run. I think Huawei lets watch GPS sampling every 10 seconds instead of 1 second. Heart rates are fine for walking or slow jogging but fluctuating widely at higher pace. Rated 5 out of 5 by Daniela from Lo recomiendo. El producto llegó en excelente estado. Superó mis expectativas. Adicional a ello, llegó muy rápido a mi país. Recomiendo tanto el producto y a B&H para realizar tus compras por internet. Rated 1 out of 5 by Charles from Bad Watch 03/23/2019 I have had this watch for one day (Received from FedEx on 03/22/2019 and Huaweis Factory support states the Watch is defective and to return the watch to the dealer. This store is always closed for religious reasons, so I will have to wait until Monday to process the return. But B&H Photo will never post this review as all my previous reviews were deleted or never posted. Will it sync up with Apple iOS devices with the Text Message notification so I can get notification and display the messge came from the iphone? While you will receive notifications with this watch, with Android or iOS, you cannot read or reply to messages. This watch uses Huawei's newer &quot;Lite OS&quot; which simply does less than Android Wear, mainly to increase battery life.